I love this picture of Alvin because it makes me smile! That is what he was to all that knew and loved him a big smile. Alvin gave me so many wonderful things in life. It was through his process of transitioning, death by disease that I confirmed what we must do to sustain a disease free life.. Supporting Alvin through his transition gave me the Omnipotent Nature of Divine Wisdom in the life and death process. What the Science of Lymphology teaches is not taught in any school known and it explains Alvin's long journey of living with dis-ease. Not only did I gain the wisdom of the miraculous self-healing body, I also gain the wisdom of unconditional love from Alvin. The many acts of kindness that Alvin did will live in the minds of all that received it. Alvin R. Foulks was born on April 19, 1950 to Isaiah Foulks and the late Levonia Foulks. He made his transition on Wednesday, October 28, 2003 in pain but he was at peace. He was educated in the District of Columbia Public School System and graduated from the University of the District of Columbia, where he worked from 1974-2001 when he retired. Alvin accepted Christ at an early age and had a strong will and faith in God. 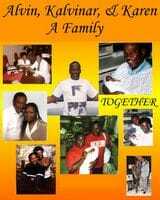 He leaves to cherish his memory a devoted father, Isaiah Foulks, 3 sisters, Shirley Boggins, Sandra Foulks and Lisa Ford. 3 Brothers, John, Leroy and Kennedy Foulks. 4 Aunts Alice Smith, Margie Webb, Sylvia Robinson and Dorothy Skinner. One uncle Melvin Person, loving mother-in-law, Shirley R. Hardy, and two god children Tamyia Davis and Jamal Cotton. Nieces, nephews, great nieces, and a great nephews and host of relatives and friends. On April 15, 1986, he married Karen Davis after a 4 year courtship. From this union was born Kalvinar Russell Foulks on March 22, 1992 who preceded him in death. Once again I find myself smiling, just thinking about how much Alvin loved his son. We had him in our lives for such a short time, but it gave Alvin so much joy in his life to have a child and a boy child. He was a wonderful father and he continue to show that in his love for children and how he took such care in the raising of his niece and God child Tamyia Davis. I, we, miss his presence everyday. But I know that he is here right now, I can feel his energy presence. To honor Alvin's inspiring and incredible life The Ark of Self-Healing & Self-H.E.L.P (Health Education for Longevity & Peace) has developed the Get Healthy Stay Balanced Workshop.